Agriculture is a constantly changing industry, continuously adopting new technologies in order to make each process more efficient, sustainable, and, ultimately profitable. Precision agriculture technologies have been around for over two decades and are becoming a dominating presence in the field. These technologies include yield monitors, variable rate technologies, and guidance systems used separately or together to assist in farm management. These technologies make it possible to reduce fuel and input expenses by optimizing the application of seed, fertilizers, and pesticides while increasing the overall yield. Yield monitors are the most commonly used precision agriculture information technology. Used mostly on harvesting combines, yield monitors can be easily installed or retrofitted on new or old equipment. The monitors give real-time yield data based on sensors placed within the equipment. Used in combination with global positioning systems (GPS), yield monitors can link the yield data with a specific location in the field and save the data for later use by the farmer. This information can also be used to generate real-time maps of the field with yield rates shown on the display mounted in the combine cab. Moisture readings can also be read by a sensor in the harvester’s elevator, allowing the farmer to make more informed storage decisions. Yield monitors are an important piece of technology and while they are the most commonly used, many farmers do not take full advantage of the GPS mapping capabilities they possess. Variable rate technologies allow planters, sprayers, and other application equipment for fertilizers and pesticides to continually adjust their distribution rate in real time based on field conditions as the equipment moves through the field. Specific field conditions that trigger adjustments may include soil type or condition, nutrient requirement, and pest levels. In the past, the risk adverse farmer would apply the highest amount of fertilizer needed by any part of the field uniformly to the entire field. As fertilizer prices have risen with the increased cost of nitrogen, phosphate, and potassium, this is no longer an affordable option for many farmers. Price aside, overuse or poorly timed use of fertilizer and pesticides can lead to nutrient runoff into wells and waterways. By varying the rate of application to the needs of each specific part of the field, there is reduced environmental harm and a savings in input costs without sacrificing yield. Today, VRT’s can control two or three products at the same time, saving time and fuel. The systems can control and vary boom height of sprayers and seed depth on planters based on the needs of each section of the field. To avoid overlapping and missed patches, the GPS allows the application or planting to be turned off when the respective equipment is about to cross over an area of the field already sprayed or planted and when it is reaching the edge of the field. These small adjustments add up to big savings in the long run. Guidance systems for precision agriculture use GPS data to track the equipment and its location in the field in real time. The most advanced systems record data every two seconds as the equipment travels across the field. These systems may use real-time kinematic satellite navigation (RTK) to make corrections to the GPS signal. This results in measurements accurate to the sub-inch in real time. Manual or automated steering systems can be added to equipment to help the farmer reduce overlapping and skipped areas. Manual steering is less expensive and simply guides the farmer accurately through the field by use of a GPS display screen. Auto steering uses the same GPS principle but steers the equipment itself via an attachment to the steering wheel. Even the most experienced farmers show some kind of human error, whether it’s overlapping and spraying an area already sprayed or missing a swath as they pass through the field. These errors can be costly and have a negative effect on yield potential. 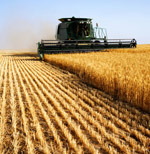 Guidance systems allow for precise and repeatable steering, leading to savings in input costs and an increase in yield. The use of precision agriculture technologies is growing but it still has a long way to go before it is commonplace in U.S. agriculture. While large-scale operations seem to be a better fit for the technology, precision agriculture has its place in smaller scale farming such as orchards, pastures, and turf management. The investment in knowledge and equipment has value not only for the cost savings and yield potential, but for the integration of precision agriculture into crop insurance as well. The data collected from the precision agriculture technologies can be used to create maps showing field boundaries. These maps can be used to show planting, application, and yield history and the data can be saved and exported to your insurance provider. The use of precision agriculture technologies for insurance purposes means more accurate information and less time spent filling out complex paperwork.